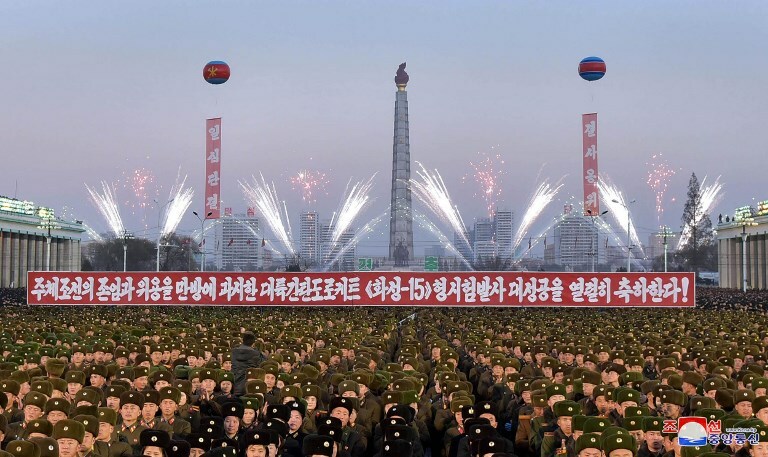 North Korea held mass celebrations for its latest successful long-range missile test, Pyongyang’s state media said Saturday, with a propaganda-filled display of fireworks and dancing in public squares. The ruling Workers Party official daily Rodong Sinmun covered its front page with colour photographs showing thousands of tightly packed soldiers and people applauding in Pyongyang’s Kim Il-Sung square, which was decorated with large portraits of the North’s late leaders. The US in response warned that Kim Jong-Un’s regime would be “utterly destroyed” if its pursuit of a long-range nuclear missile arsenal provokes a military clash, and has battled to maintain international solidarity in the face of North Korea’s nuclear threat. Kim himself was absent from the celebrations — he usually stays away from such events — but Friday’s gathering drew key military, party and government leaders. “Long Live the General Kim Jong-Un who has brought us the great historic cause of nuclear statehood”, another banner read. Vice Chairman Pak Kwang-Ho of the party’s decision-making Central Committee told the crowd that, after Wednesday’s test launch, “now no one can infringe our sovereignty and rights to survive and develop”, according to the daily. He said that the United States had been “jolted” at the strengthening of North Korea’s nuclear force and could attempt to commit “robber-like” provocative acts. He repeated Kim’s warning that the North would respond with the “highest level of hard-line countermeasure in history”. Kim first made the threat in September in response to US President Donald Trump’s UN speech threatening to destroy the North and mocking him as “Little Rocket Man”. The ICBM Hwasong-15 type weaponry system used in Wednesday’s test is an intercontinental ballistic rocket tipped with super-large heavy warhead capable of striking the whole mainland of the US, the North said. But analysts remain unconvinced that the North has mastered the technology required to launch and direct a missile, and ensure it survives the difficult re-entry into the Earth’s atmosphere.